Types of Henna Art – The wonderful form of body art that is henna has evolved beautifully over the course of several decades. Experimentation is the key to progress and innovation and modern henna art is a magnificent mix of tradition and contemporary. Henna is a well-known art form but times have changed and the people who aren’t enthusiasts and only get henna done a once or twice a year may not have kept up with the ever-fluctuating henna trends. 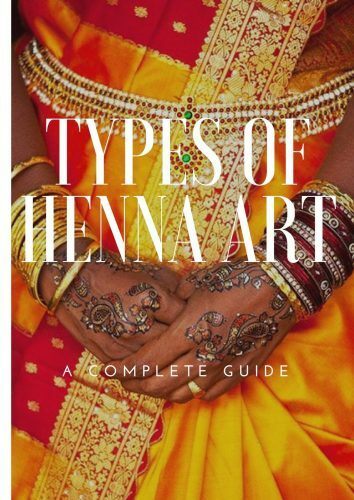 So here we present a complete guide to knowing the different forms and types of henna. Indian designs tend to be more organic, flowy and curvy. There are a lot of paisleys, flowers and peacocks. There’s a subset of Indian henna designs called the Arabic. These usually tend to be asymmetrical with a lot of open space and a mixture of thick and thin lines. Moroccan henna designs are characterized by geometric forms and a lot of straight lines. The designs from the north around Fez are usually more geometric. We also see a lot of leaves and flowers and curvy lines in the designs from the south. But in general, when you see something that’s very geometric, that tends to be a Moroccan design. Moroccan designs also contain a lot of very powerful symbols of protection and fertility and also to keep the evil eye away. More and more designs lately have been featuring some form of life art, some of them are complete portraits, some feature the face only. Some cartoonish, some fantastic and some hyper-realistic. Portraits: Most popular of these are the Dulhan ones which are heavily present in bridal Indian henna designs these days. Aside from dulhan, artists have drawn portraits of real-life people with henna as well. Full Figures: These are head-to-toe complete figures, normally drawn in places that can hold the whole design. Animals and Birds: Kids are really fond of these designs and elephants and peacocks are also prominent in Indian mehndi designs. Ganesh: The Hindu idol is also a popular figure that is incorporated in detailed and intricate designs, as well as single portraits. Cartoons and Superheroes: Another type of figures most popular among the kids. You see Spider-man and Minions and Doraemon among the plethora of designs requested by kids. Fantastical Creatures: Unicorns, dragons, fairies and the like. Hyper-realistic Designs: Incredible drawings of living creatures that are disturbingly close to reality are one of the greatest examples of modern henna designs. Inanimate objects are also portrayed in as many and fantastic variations as the animated ones. We have buildings and flowers, dream catchers and half-moons and many more. Now not only women but also children and men are partial to henna designs so they are moulded as such. Tattoo designs have become popular and these are the most intense. These can have both animate and inanimate objects with a dash of realism and the traditional design elements thrown into the mix. These are rare but not entirely uncommon. Only a few solely feature some form of the script written in henna, most of the times they are paired up with different other forms of designs with the script as non-dominant. White henna is “henna” only by name. It’s not made from the henna plant, rather it’s just a white paste used for body art same as henna which is why it’s been dubbed that. One of the most popular places for henna artists and customers alike. These designs can span the entire length of the arm, from the shoulders down to the wrist or just anyone space in between. Another popularly requested designs are the feet designs. Amusingly, henna is also applied to the soles of the feet. Perfect for those little peekaboos out of bridal lehngas. This is one of the bolder designs more common in the West. Go well with mini skirts, shorts and the like. These can either be on the upper back or lower back or both. They look especially radiant and magnificent because the enormous space allows both ingenuity, ease and breathing room. These are called the Henna Crowns and people with bald heads, men and women alike, are partial to this particular form of henna design. Henna crowns are typically all elaborate mandalas. Belly henna can also be divided into two types of designs: flat stomach henna and pregnant stomach henna. Henna is sometimes also used because of the soothing cooling sensation it provides after application. That is why pregnant women are fond of this design. Slightly lower than the throat region and a little above the chest area, this type of design imitates neck jewellery. These are gorgeous and intricate pieces that have bead like dangling lines complementing the jewellery effect. Neck henna is directly on or very close to the throat. It’s also sometimes on the back of the neck. Although comparatively less eminent, cute ear henna doodle designs do exist. 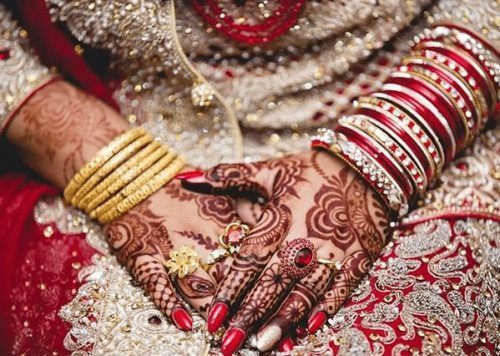 We hope reading this article has been an illuminating experience and that it provided a satisfying catching-up on all the latest mehndi designs and trends as we wanted it to. For more articles on amazing henna designs, please do visit our website.